Every February, Globaloria students and educators across the country open their classrooms to parents, education leaders, policy makers, press and members of their community for the annual national Digital Learning Day. Through our partnership with the Alliance for Excellent Education, the World Wide Workshop travels to Globaloria schools around the country for Digital Learning Day, to help celebrate innovative teaching practices that make learning more engaging and impactful. Students and educators demonstrate for a wider audience the transformational digital learning and teaching taking place every day in Globaloria classrooms around the country. Hats off to former Governor Bob Wise and his team for creating a national day to honor pioneering students and educators! 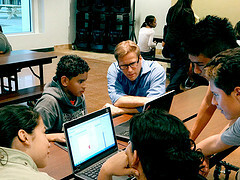 To learn more about Digital Learning Day, check out coverage from past years.